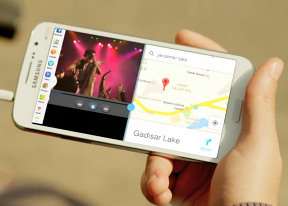 The Samsung Galaxy Grand 2 runs on Android 4.3 Jelly Bean skinned with Samsung's TouchWiz UX. Its predecessor is going to get KitKat later this year, so hopefully Galaxy Grand 2 will get the same treatment even sooner. The good news is that even without the KitKat optimizations, the Galaxy Grand 2 manages to run the user interface and most Android applications without much stuttering, thanks to the 720p display resolution. We've shot a quick video showing off the user interface to give you a feel of what it's like. The lockscreen has multiple panes, each containing one widget. The page to the right of the default one is special and can either be a list of favorite apps (the default TouchWiz setting) or a shortcut for the camera (as in unskinned Android). The homescreen is identical to what you get on most Samsung devices since the Jelly Bean release. You can move between multiple panes with left or right swipes. Swiping down from the top bar reveals the notification area, where you'll see five toggles at the top, which are used to quickly enable and disable some of the phone's features. You can reveal more by swiping left, or simply display a full list. There are dedicated SIM shortcuts for quick switching between the two SIM cards. A two finger swipe down on the notification banner directly opens the grid of toggles, and holding down on a toggle will directly take you to the relevant setting. Otherwise, swipe left or right to quickly dismiss a notification, or tap it for more information. You can pinch zoom to get into the overview mode of all homescreen panes, where you can have as many as 7. Dragging an app or widget onto a homescreen is made easier thanks to the small thumbnails that show up with silhouettes of how they're populated. This gives you an at-a-glance look at how much room you have to work with on each homescreen. The app drawer can be sorted as a customizable grid, alphabetized grid or list and some shortcuts can be hidden - good for bloatware you can't uninstall. The App switcher (accessed by holding down the home button) shows a list of thumbnails of all the recent apps, which can be swiped away to dismiss. There are three buttons at the bottom: Task manager, Google Now and Kill all apps. As usual Google Now is here to let you use voice commands and integrates with your Google account to provide all sorts of information from internet searches to your daily routine, localized traffic, and current weather conditions. Samsung devices also come with the included S Voice voice assistant. While Google Now focuses on more search related and organizational activities, S Voice allows you to control your phone directly. You can call, text, launch apps, control music, change sound settings and much more.